PORTLAND, OR — Here are three things we learned from Thursday night’s NWSL Championship, a 1-0 win for FC Kansas City over Seattle Reign FC. Heather O’Reilly can still change the game: O’Reilly spent much of the match on her customary right side bottled up with limited space. But in an instant, she changed the game by making a spur-of-the-moment switch to the left side where she got into space and sent a perfect cross that Amy Rodriguez finished for the only goal of the night. The play transpired right after Reign right back Kendall Fletcher was forced out of the match due to injury with Elli Reed coming in to replace her. O’Reilly and head coach Vlatko Andonovski both denied making it a point to attack Reed right off the bat—even though Fletcher was down long enough that both teams huddled by their benches. Speaking of ARod: Four years ago, Rodriguez was on the wrong end of an excruciating WPS final loss with the Philadelphia Independence when she missed several golden opportunities in extra time in what turned out to be a loss on penalties to the Western New York Flash. After two years away from club soccer due to the absence of a league and the birth of her son, Rodriguez has returned a more efficient and lethal finisher. 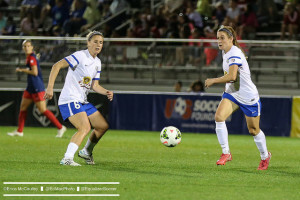 Her goal in Thursday’s final was the third scored in the last two finals by FC Kansas City. Rodriguez has them all. It was the fourth goal scored by FC Kansas City in this year’s playoffs. Rodriguez has three of them. It turned out to be the 78th minute, but Rodriguez made good on her only chance of the final, getting on the end of O’Reilly’s cross and getting Reign keeper Hope Solo off balance for the finish. Rodriguez was ready, and FC Kansas City have won two NWSL Championships in a row. Reign never got it going: The Reign defended exquisitely for much of the night, but the lack of ability to create and finish their own chances allowed one, untimely defensive breakdown to sink them in the final for the second consecutive season. The Reign were limited to seven shots on the night, three of which were saved by Nicole Barnhart and another that Megan Rapinoe smacked off the post. “That’s not enough,” Rapinoe said matter-of-factly. The engine in midfield, Kim Little, was denied the ball much of the night and when she got it, found the FC Kansas City defense well positioned to deal with her golden touch.